AET’s newest pressbrake, the 4.1 metre, 200 tonne Xpert machine from Bystronic, is already impressing the team, just a few days after installation. 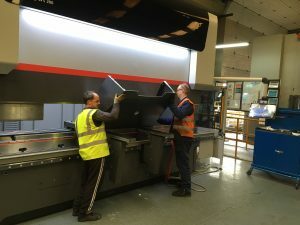 The press was designed and configured to give an additional 200mm of daylight and stroke, to allow AET to easily press deeper and more complex components. 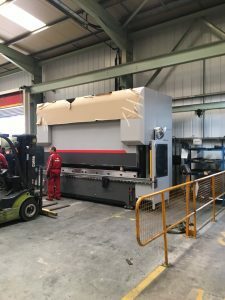 One of AET’s key sectors is construction equipment, and deep pressings for this industry were particularly challenging with the previous machine. ‘The fact that Bystronic could provide a specific machine which overcomes these challenges is a huge bonus to us. We are going to be so much more efficient with this group of components with this press and we will be able to offer even more flexibility to our customers’, commented Jason.